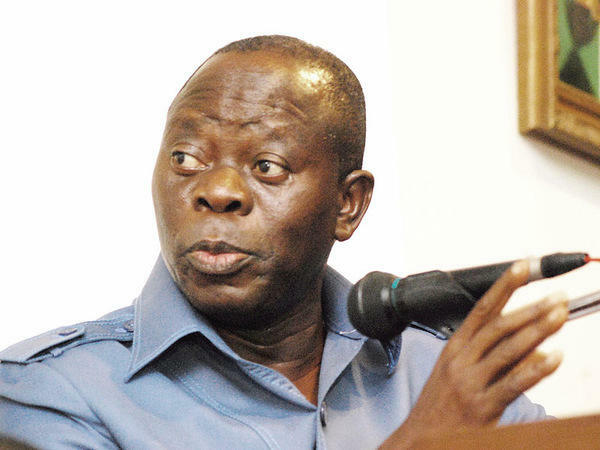 The National Chairman of the ruling party, All Progressives Congress (APC), Adams Oshiomole, has said that with the emergence of President Muhammadu Buhari as the party’s presidential candidate for the 2019 election, it is set to especially, engage the opposition Peoples Democratic Party (PDP) on issue-based campaign. It is gathered that Mr Oshiomhole stated this in his address of welcome at the party’s National Presidential Convention, which ended in the early hours of Sunday. President Buhari scored a total of 14,842,072 votes at the party’s recent presidential primaries held across the 36 states of the federation and the Federal Capital Territory (FCT) as announced by Kayode Fayemi, Ekiti State Governor-elect. Mr Fayemi, who was the Chairman, APC Presidential Primary Committee, later asked the no fewer than. 7,000 delegates from the 36 states of the federation and the Federal Capital Territory (FCT) to affirm the president’s candidacy through a yes vote, and they did affirm the candidacy. Aside the statuary delegates, the delegates who were drawn from the 36 states of the federation and the Federal Capital Territory (FCT), were made up of three from each local government area. Mr Oshiomhole maintained that with President Buhari as the party’s presidential candidate, it was now ready for the 2019 election, adding that the president had given a good account of himself as a leader who led by example. He added that unlike some political parties in the past, the APC decided to elect President Buhari as its presidential candidate for the 2019 presidential election using the direct primary mode to give all party members a say. He said that the APC would scrutinise the records of whoever the opposition party, especially the PDP ,brought up as its presidential candidate for the 2019 election. This, he said, would be done with a view to bringing their past deeds to the public to enable them to make good choice. at the records of the opponent, we will look at his pedigree, we will challenge them on their track records,” he said. The national chairman, however, dismissed claims by members of the opposition PDP that the federal government was being selective in its anti-graft war. He also said that the complaints by opposition figures that the President Buhari-led administration was being heavy-handed should be ignored. According to him, the present government was being too mild compared to past administration which he said always harassed and intimidated those in the opposition, saying that he was a victim of such harassment. “As a sitting governor then, I was denied the use of a public airport. “Mr President, sometimes I feel you are too mild. I was under threat of impeachment, I had to remove the roof of my State House of Assembly in order to survive. “One of your predecessors used seven people to remove a sitting governor. I am, however, not in anyway suggesting that you do the same,” Mr Oshiomhole said.